1.9" x 5.7" stitched on 14 count. 1.4" x 4.4" stitched on 18 count. Groovy Bookmark cross stitch pattern... 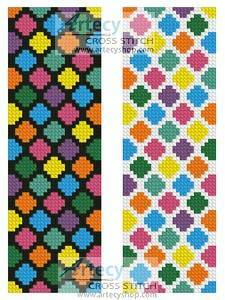 This counted cross stitch bookmark pattern was designed by Artecy Cross Stitch. White DMC cotton can be replaced with black for a black background instead of white. Only full cross stitches are used in this pattern.